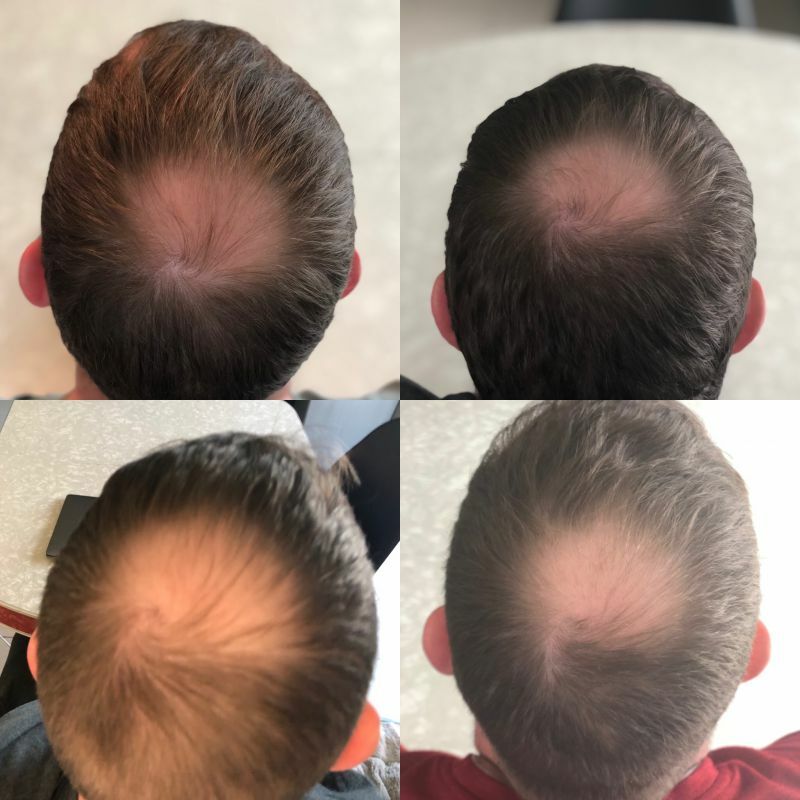 REVIEW – As a man starting to hit middle age a lot faster than I would like, one of the biggest realities I’ve had to face is the onset of male pattern baldness. In all reality, I could think of much worse fates to be honest, but around Christmas, I had a picture taken from behind and it was an eye-opener as I realized the spot on the back of my head was thinning much faster than I had thought. I have naturally thin hair as well, so any additional thinning just isn’t a good thing for me. So, when the call was sent out for a review of the Hairmax LaserBand 82, I jumped at the chance. Worse case scenario in my mind was that I’d be no worse off in the end. Now, this review is going to be a bit different from most reviews here at the Gadgeteer. While most products we look at are pretty straight forward and can be reviewed in a day or two, this product recommends a full 26-week usage cycle to see full results, with continued usage beyond that time period to maintain results. Thus, I will have this initial post with my first 4 weeks of usage and then updates monthly until I reach the full 26 week period. Before I get into the meat of the article, let’s get the basics out of the way. 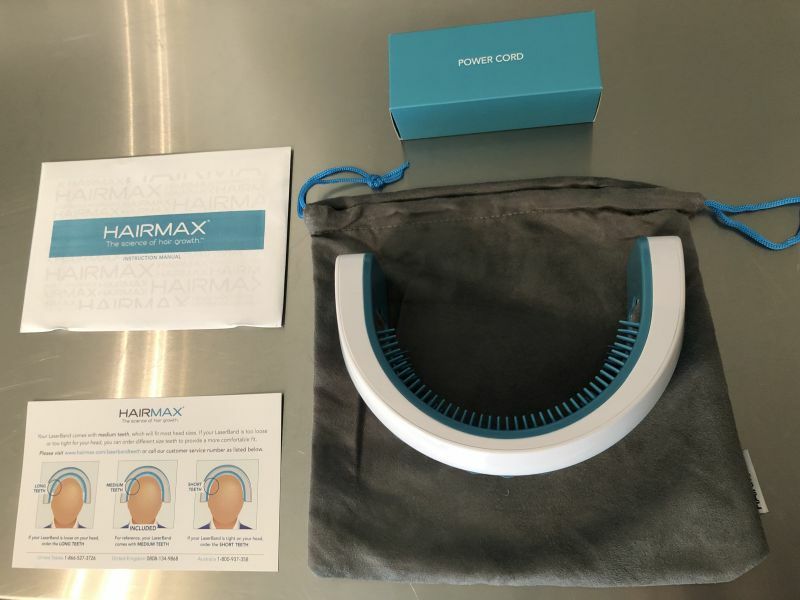 The Hairmax LaserBand 82 is a laser therapy device intended to reverse the hair miniaturization process by stimulating and energizing hair follicles using a crescent-shaped laser band that you move across your head in 30 second or 4 second intervals. Three treatments a week for about 90-120 seconds per treatment is sufficient to provide results according to their documentation. The LaserBand is rather lightweight at 15 ounces. 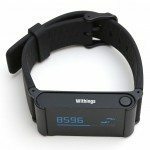 The 82 in the product name refers to the 82 laser heads within the band that provide the laser therapy. 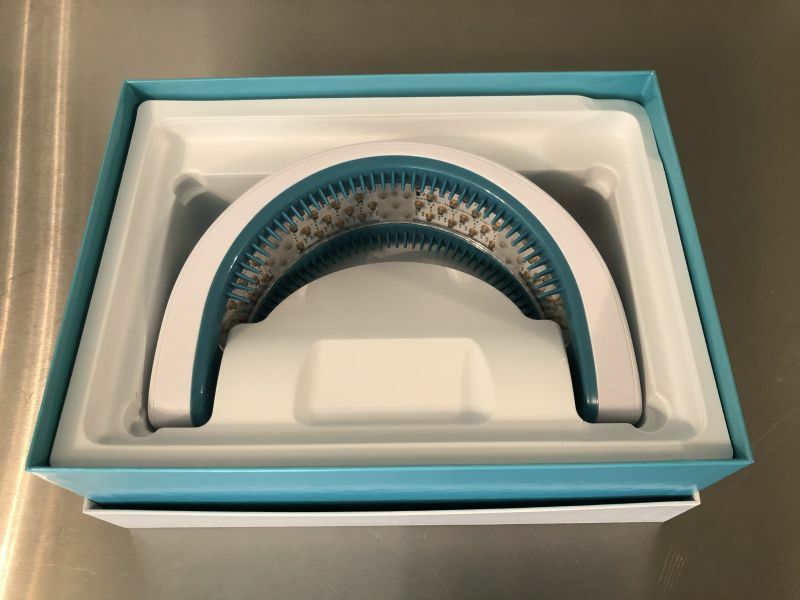 There are removable teeth on the front and back of the unit that help part and move hair out of the way to expose your scalp to the lasers throughout the treatment. I note that these are removable because you can order different size teeth based on your head size to adjust the fit of the band. Turning the unit on is very simple, there is a power button on the right side of the unit that you press once for 30-second treatments or twice for the 4-second treatments. At each interval, it vibrates to let you know when to move it back to the next section of your scalp. If using 30-seconds, you go through one full movement front-to-back through your hair, if you use the 4-second interval then you do 6 cycles front-to-back to complete a treatment. Also, it has a pretty cool Sci-fi look to it during treatments! Other than providing a 4-5 hour charging period before your first treatment, there isn’t much set-up to this device unless you find you need to change out the teeth for head size adjustment – instructions for doing so are included but you’ll need to buy the teeth separately. There are guidelines on who this treatment is optimal for, as well as results for patients who have been subject to clinical trials. From the chart above, you can see there are varying hair types that have proven to be successful. I fit within the category III for men. 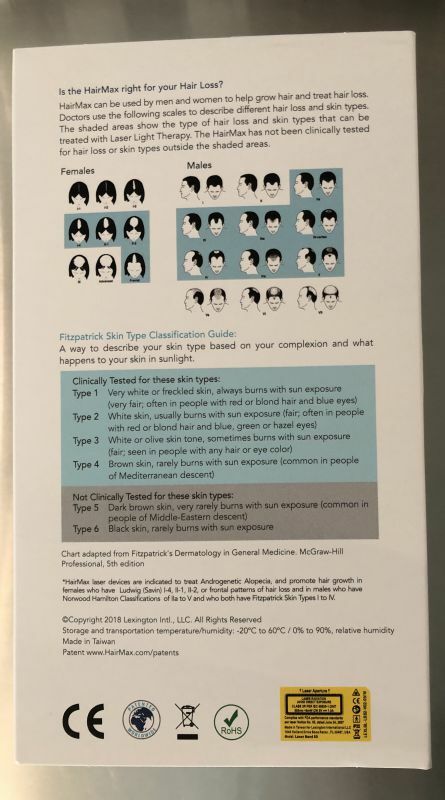 Unfortunately, this product hasn’t been clinically tested for Type 5 or 6 skin types, which is listed as dark brown and black skin tones. Now this doesn’t mean it won’t work, just that it hasn’t been clinically tested on those skin types. I fit in Type 1 skin tone. The documentation included within the package indicates that weeks 0-12 will most likely not produce noticeable results. But I took a picture each week to keep track. Upper left is week 1, upper right is week 2, lower left is week 3 and lower right is week 4. So, as you can see, there isn’t much as far as visible results thus far, but that is to be expected. This will provide a good basis for comparison as the weeks go along. As far as the actual device, it is not uncomfortable to use at all. The teeth feel just like a heavy comb or brush as I push the unit back through my hair. It’s recommended to keep it as tight to the scalp as possible as you move it, so it kind of massages the scalp along the way as well. 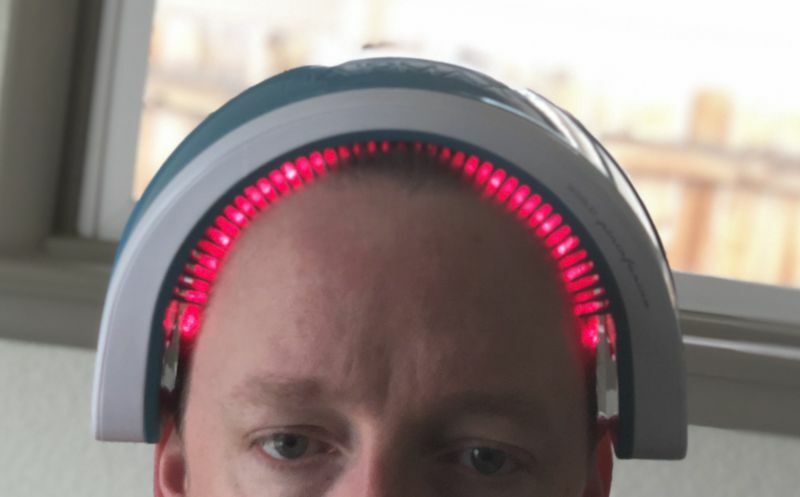 There are several warnings to refrain from looking directly into the lights, which isn’t always the easiest to do when taking the unit off your head. 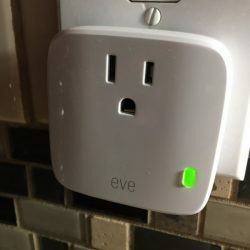 Turning the unit off takes a long press of the power button, but you have to be looking at it to know whether it turned off or not. 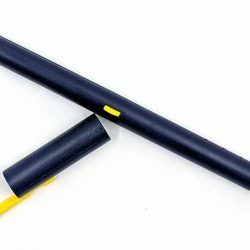 Maybe having an additional distinct vibration when powering off would be helpful to avoid the risk. Ready to go out of the box, no assembly, simply charge it. Easy to use, 3 times a week in 90-120 treatments. 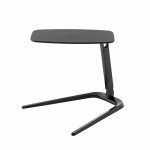 Comfortable – I was really afraid the band wouldn’t feel comfortable sitting on my head. I’ll hold off on any other “needs improvement” until I’m further into the treatments. 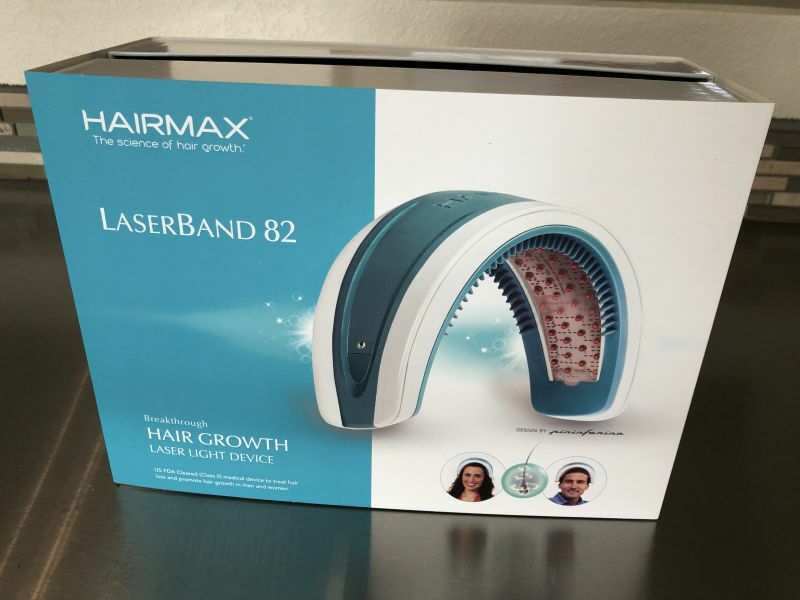 Thus far, the Hairmax LaserBand 82 has been a breeze to use. I’m hopeful that in another 8-12 weeks, I’ll see some significant changes start to take place. At the $799.00 price point, I would expect that it does produce some recognizable results. Until my next update, thanks for stopping by. Where to buy: Hairmax Website or Amazon for $10 less. Source: The sample of this product was provided by Hairmax. Sorry but the strong men currently are all bald like JASON STATHAM, Vin DIESEL, DwayneJOHNSON ( as strange as it may seem they are gathered in the latest franchise “fast & furious” that comes out this year). There is also Bruce WILLIS and there was Yul BRYNNER. The richest man in the world is Jeff BEZOS. Sorry, I have myself a baldness worthy of Elon MUSK.I prefer to invest in a hair clipper “WAHL CLIPPER 1919”. In addition, it is scientifically proven that bald men have more testosterone. If loving this website is wrong, I don’t want to be right.